Congress is seeking legal remedies to block further concessions by the Obama administration to Iran, according to a leading member of the House Intelligence Committee, who told the Free Beacon that the administration has been systemically misleading Congress about the nature and scope of its giveaways to Iran. Obama administration officials confirmed overnight that an $8.6 million deal to purchase nuclear material from Iran was functionally finalized in late April. The administration had in recent months refused to answer questions about the payment from lawmakers and journalists, claiming that the deal had not yet been finalized. The revelation triggered condemnation from leading members of Congress as well as top nuclear experts, who linked the administration’s contradictory statements to efforts by U.S. officials to quietly promote Iran as a legitimate nuclear industry player and economic power. U.S. officials confirmed to the Free Beacon late Monday that the United States had finalized a deal to purchase more than 30 tons of heavy water, a nuclear byproduct, from Iran for around $8.6 million. The deal is meant to ensure that Iran did not cross limits on such material imposed under last summer’s nuclear deal. A U.S. official confirmed late Monday that while the deal was officially announced as complete yesterday, it was actually concluded in April, when the administration first disclosed its effort to buy the nuclear materials. “The heavy water deal was really concluded in April and it just took a few months to make all the necessary arrangements you would expect from such a deal,” the official told the Free Beacon. Sources familiar with congressional efforts to obtain specific details about the purchase—including how U.S. funds would be sent to Iran without violating current sanctions—maintain that the administration intentionally stalled Congress until it became impossible to block the transaction. Another congressional insider familiar with the administration’s thinking said the information blackout was part of an effort to preserve U.S. diplomacy with Iran. “The result is that the administration managed to boost Iran’s status as a nuclear supplier, even though experts say the program remains illicit, which will make it more difficult for future presidents to address Iran’s bad nuclear behavior,” the source said. The Institute for Science and International Security, a leading authority in the field of nuclear technology and proliferation, said the Free Beacon’s report is proof the Obama administration is continuing to let Iran slide on its commitments under last summer’s nuclear accord. The group maintains that the heavy water transaction helps Iran skirt restrictions on the amount of heavy water it can procure by allowing it to control and store excess amounts in Oman. This in turn legitimizes “Iran as nuclear supplier before [it has] proven itself,” particularly in light of recent German intelligence reports indicating that Iran continues to purchase illicit nuclear-related materials, according to the think tank. The administration did not respond to Pompeo for around two months, missing a congressional deadline. When it eventually responded, officials declined to provide information to Pompeo about the nature of the payment and other key details. Congress is expected to vote Thursday on legislation spearheaded by Pompeo that would ban the administration from carrying out similar purchases in the future. The Obama administration announced its opposition to that legislation late Monday evening, claiming it would “interfere” with its efforts to uphold the nuclear agreement. 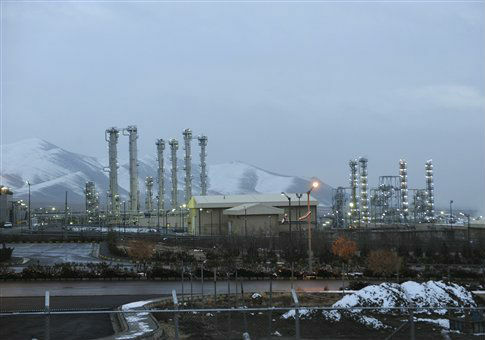 The administration claims that it needs the ability to make future heavy water purchases from Iran.